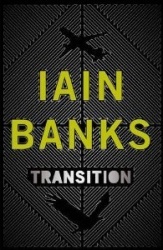 Iain Banks’s most recent book is a science fiction novel – even though it’s published under his non-sf nom de plume. I suppose this is a marketing thing, but maybe he’s just decided to do away with his sf pseudonym, Iain M Banks. Unlike just about all of his science fiction books, it’s not a space opera, nor is it a Culture story; it’s also very much Earth-based and flashback-laden. It is, therefore, superficially a lot like his literary fiction novels, but it is definitely sf. It’s about the Concern, or l’Expédience, a multiple reality-spanning organisation based on a version of Earth where everyone (or a sizeable minority of people) are Aware, able to travel between realities and into host bodies with the aid of a drug called septus. The Concern’s business is, on the face of it, benign: saving the lives of people who will be important in the future, assassinating unsavoury characters, providing the odd nudge here and there for the good of mankind. Whether this mission is the Concern’s true concern is part of the story that unfolds. Each chapter is divided into a varying number of sections, each coming under the heading of the name or a description of the character who is the focus of that section. The main characters thus described are Patient 8262, the Transitionary (transitionary being a term for someone who can jump into other bodies in other realities), the Philosopher, Adrian and Madame d’Ortolan. As you’d expect from an Iain Banks novel, the titles of the first three characters are deliberately used to conceal their identities. Each of the main characters (except d’Ortolan) is written in first person persective, present tense. There are so many flashbacks in the story that it’s often difficult to remember that the characters are speaking in the present tense. There are also a few sections where the first person is replaced by the third. There’s one part where this makes sense, but on other occasions I didn’t see the logic of it. I started off enjoying this book immensely. The classic Banksian techniques and style and the fascinating scenario really hooked me. The writing is efficient and engaging all the way through. The use of concealed identities, multiple viewpoints, mulitple timelines and the slow revealing of information created an impression of layers of intrugue, both in terms of the plot and the reader’s understanding of the plot. There are some wonderfully intense passages. The part where the Philosopher describes his family – how his abusive father rapes his mother just after she’s come home from giving birth to the character’s sister – is utterly chilling – as is the Philopher’s subsequent life and career. Patient 8262’s descriptions of the assissinations he’s committed are classic Banks – creative and sadistic. Ultimately, however, despite everything it has going for it, the book didn’t fulfil its early promise. Concealing the identities of the characters turned out to be pointless. Structurally, the book resembles Banks wonderful Use of Weapons and I think he was trying to pull the same trick, but when the truth was revealed it didn’t have any force. I feel that one of the viewpoints – maybe a fifth of the book – could be completely excised at no loss to the story. The pacing didn’t feel right at a crucial point in the story. More than halfway through, there is an important turning point. The next two or three chapters are full of things that happened in the past. The reader is left hanging in a most annoying way. Then the main character develops superpowers akin to Paul Atreides at the end of Dune and in Dune Messiah. And the most important character in the story, the one who understands everything and who finally solves the issue isn’t a viewpoint character, but someone who turns up every now and then. I almost feel that Iain Banks spoiled this novel by wanting to write it like Iain Banks. It wasn’t bad – it certainly had some great elements, not least the world-building – but it wasn’t nearly as satisfying as it should have been.